Ohio State wide receiver K.J. Hill tries to avoid Michigan defensive back Josh Metellus after making a catch during last year’s OSU-Michigan game in Michigan Stadium. Dwayne Haskins (3,685 yards, 36 touchdown passes) played well against Michigan last season after J.T. Barrett was forced out of the game by a knee injury. He has four of the five 400-yard passing games ever by Ohio State quarterbacks. Shea Patterson (2,177 yards, 18 touchdown passes), a transfer from Mississippi, has brought the consistency that was lacking at that position at Michigan. J.K. Dobbins (915 yards) set career highs in yards (203) and carries (37) in OSU’s 52-51 overtime win at Maryland last week but there was so much else going on it was almost overlooked. Mike Weber (711 yards) missed the Maryland game with a bruised quadriceps but is expected to play this week. Michigan’s Karan Higdon (1,106 yards) has gained 100 yards or more in eight games. Ohio State has the deepest group of receivers in the Big Ten, led by Parris Campbell (66 catches) and K.J. Hill (62 catches). Donovan Peoples-Jones (32 catches, 477 yards) and Nico Collins (29 catches, 461 yards) are Michigan’s top wide receivers. Tight end Zach Gentry (30 catches, 475 yards) is also a big part of the passing game. Left tackle Thayer Munford left the Maryland game with a leg injury in the first quarter and did not return. Joshua Alabi did a solid job as his replacement. Munford is probable this week. Michigan’s offensive line, which came into the season as a question mark, is trending up and position coach Ed Warinner, a former Ohio State assistant, is getting much of the credit. Michigan has rushed for at least 171 yards in its last 10 games. Nick Bosa had four sacks in 2 ½ games. At that pace he would have 17 sacks right now. Think about what that would have done for every level of OSU’s defense. Rashan Gary, who had two sacks against Ohio State last season, missed three games earlier this season with a shoulder injury but appears near 100 percent again. Chase Winovich, has 13 tackles for losses and four sacks. He was injured last week against Indiana but says he will play this week. Michigan leads the country in fewest yards allowed per game at 234.8. Baron Browning will return after missing the last two games because of an injury. Ohio State allowed 339 rushing yards against Maryland. Three plays produced 208 of those rushing yards. Michigan linebacker Devin Bush (72 tackles, 5 sacks, 9.5 tackles for losses) might be the best linebacker in the Big Ten. Josh Uche is a sack specialist with a team-high seven in limited playing time. Ohio State has one interception in its last four games and has gone without an interception in seven games. For Michigan, cornerback Brandon Watson and safety Josh Metellus both have three interceptions. Michigan has scored four touchdowns on interceptions. When Blake Haubeil took over the No. 1 kicker duties it was reported that Sean Nuernberger was injured. The job seems to belong to Haubeil even if Nuernberger is healthy. Michigan walk-on Jake Moody had never attempted a field goal in a college game before going 6 for 6 in a 31-20 win over Indiana last week when No. 1 kicker Quinn Nordin was too sick to play. https://www.limaohio.com/wp-content/uploads/sites/54/2018/11/web1_K.J.-last-year-1.jpgOhio State wide receiver K.J. 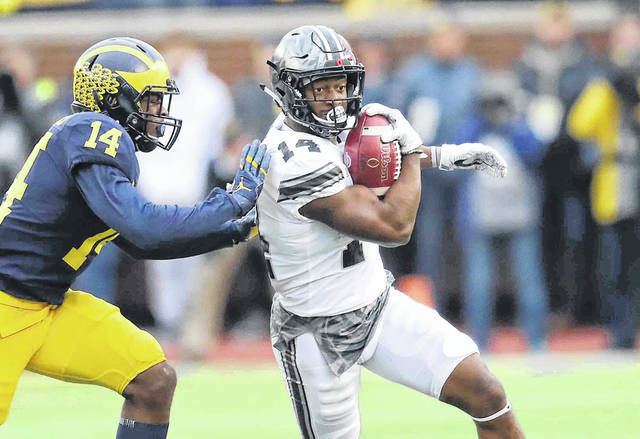 Hill tries to avoid Michigan defensive back Josh Metellus after making a catch during last year’s OSU-Michigan game in Michigan Stadium.